What Motivated Founding Your Company? Kadimastem is driven to replace, restore, or repair functionality of diseased and malfunctioning cells and organs in degenerative diseases. Our vision is that transplantation of healthy and functional cells will release patients from the burden of degenerative disease. This approach can be applied to diversified therapeutic programs with enormous unmet need and blockbuster potential. Kadimastem is targeting severe neurodegenerative diseases (eg, amyotrophic lateral sclerosis [ALS]). In ALS, despite selective motor neuron death, there is solid evidence that astrocyte malfunction plays a crucial role in disease progression. Thus, transplantation of healthy astrocytes may compensate for the dysfunction of diseased astrocytes. Kadimastem manufactures AstroRx (clinical grade human astrocytes) derived from human embryonic stem cells for the treatment of patients with ALS. The 2 currently available Food and Drug Administration (FDA)-approved drugs for treating persons with ALS only modestly attenuate disease progression. Both are small molecules with a single mechanism of action. We believe that because ALS is a multifactorial disease, potential therapeutic approaches should consider the multiplicity of mechanisms that underlie motor neuron degeneration in this disease. AstroRx cells that act through multiple mechanisms that can potentially treat broad pathologic aspects of the disease are more likely to be more effective. In vitro, AstroRx has activities of functional healthy astrocytes, including glutamate uptake, promotion of axon outgrowth, and protection of motor neurons from oxidative stress. Secretome analysis shows that AstroRx secrete several inhibitors of metalloproteases as well as a variety of neuroprotective factors. Intrathecal injections of AstroRx into transgenic hSOD1G93A mice and rats, an animal model for ALS, significantly delayed disease onset and improved motor performance compared to sham-injected animals. A safety study in immunodeficient mice showed that intrathecal transplantation of AstroRx is safe. Transplanted AstroRx attached to the meninges along the neuraxis and survived for the entire duration of the study without formation of tumors or teratomas. Kadimastem commenced its phase 1/2a clinical study in 21 ALS patients in April 2018, the clinical trial is taking place in the neurology department of Hadassah Ein-Kerem medical center in Israel (NCT03482050). Rodin Therapeutics was founded in 2013 to advance a novel therapeutic approach focused on improving brain synaptic function. We know from prior research that synaptic integrity—the strength of connections between neurons—deteriorates in many neurologic diseases. Our goal is to develop drugs that strengthen those connections to treat a wide range of indications, including Alzheimer’s disease (AD), Parkinson’s disease (PD), Huntington’s disease (HD) and frontotemporal dementia (FTD). There’s no denying that neurodegenerative disorders are a particularly challenging disease area with high unmet medical need. Multiple recent clinical trials of experimental treatments for persons with AD have failed to demonstrate efficacy, and the resulting lack of new treatments has been deeply frustrating for patients, caregivers, physicians, and scientists. We urgently need new ways of thinking about drug discovery and development for these diseases. Our research focusing on synaptic integrity is particularly exciting at a time when the biopharma industry as a whole is coming to realize that we need to move beyond the longtime narrow focus on amyloid as the main target in AD. Fortunately, we’re starting to see new ideas blooming that cover a wider array of targets. I’m honored to be part of Rodin’s leadership team as we advance a therapeutic approach that we think has great promise to transform care for patients with neurologic diseases. Quanterix was founded in 2007 by Dr. David Walt, who is also scientific founder of Illumina, and based on the discovery of a revolutionary new technique for measuring individual protein molecules that allows measurement of thousands of biomarkers at levels never before possible. This technology breakthrough led to a vision of advancing precision health science, in which biomarker measurements can change the way diseases are detected and treated. Everything we do at Quanterix is in an effort to move our vision forward—turning today’s reactive sick care into tomorrow’s preventative health care. When Quanterix launched our Simoa (single molecule array) technology, many in the industry had turned their interest from proteins to DNA, in part because no significant innovation had taken place in protein detection in many years. While there continues to be great interest in DNA and gene sequencing, protein detection is uniquely powerful because it reveals which genes are actually being expressed. Proteins reflect the way environmental factors affect our DNA. With nearly 70% of diseases being linked to the environment today, proteins are the most accurate variables for understanding a person’s current state of health. Today, Quanterix remains dedicated to advancing precision health by focusing on the protein. IQuity was founded to give physicians new tools that could be used to accurately identify patients with chronic illness as early as possible. When we first launched, we had developed technology that could analyze a blood sample and tell us if a patient had an RNA signal specific for a particular type of disease. The signals that we were looking at were RNA levels found in blood. Measuring RNA in blood allowed us to capture a real-time snapshot of the biochemical activities taking place inside immune cells. Using this information, we were able to associate the dynamic RNA patterns we found in blood samples with specific diseases. Although we looked at many different diseases, we were particularly interested in autoimmune disease because of our background in immunology. Autoimmune diseases affect more than 50 million Americans, similar to the number of patients affected by heart disease, diabetes, or cancer. Our technology was among the first to use machine-learning advances and data science to analyze large RNA (genomic) datasets. We use these to find differences among RNAs that can distinguish multiple sclerosis (MS) and other autoimmune diseases from healthy or disease controls. This allowed us to identify RNA biomarkers (not just a single RNA, but a panel of RNAs) that could be used to accurately classify disease. Using our approach, we found that we could identify a specific autoimmune disease pattern, and within this general autoimmune disease pattern, we could find signatures for specific autoimmune conditions like multiple sclerosis (MS) or inflammatory bowel disease (IBD), Crohn’s and ulcerative colitis. This intrigued us, and we began looking at each disease, like MS, in detail. We found that RNA patterns were reproducible and could be developed into tools to distinguish persons with MS from healthy control subjects or patients with other neurologic diseases. After conversations with a number of physicians, we felt this technology could offer clinically useful information and should be commercialized so these testing options could be used in the clinic. Today, clinicians use our tests in a variety of ways, most often to accelerate the diagnostic process or to correct suspected cases of misdiagnosis. As part of our ongoing research and development, we actively follow these cases to document clinical utility and patient outcomes. Building on our experience creating genomic tests, we are applying machine learning techniques to population-level datasets from tens of thousands of patients (sources include claims data, electronic health record [EHR] data, and more). Using these data, we are developing predictive classifiers that complement the blood tests we created. This allows us to predict oncoming disease diagnoses and uncover suspected misdiagnoses. Our efforts will soon extend to creation of data models that can stratify disease activity and monitor response to therapy. We’re very excited by the opportunity to deliver these tools to key stakeholders across the healthcare continuum. What Potential Breakthroughs Are Most Exciting Now? The World Health Organization estimates that neurologic diseases affect approximately 1 billion people. Many of these diseases lack both viable treatments and noninvasive tests to concretely diagnose the disease in the first place. For this reason, we have a lot of room for improvement. I believe however, the most exciting breakthrough on the horizon lies in our ability to use biomarkers to detect neurologic diseases before symptoms are present and measure efficacy of new treatments especially in the early stages when there are few symptoms. Research shows biomarkers will remain a critical tool for progressing our understanding of diseases including AD and PD. At the same time, the FDA has acknowledged the role that biomarkers play in advancing the drug development process. This is very much already becoming a reality with the proven link between biomarkers (eg, tau, glial fibrillary acidotic protein [GFAP], ubiquitin C-terminal hydrolase L1 [UCH-L1], neurofilament light [NfL], and amyloid-β [Aβ]) and neurologic diseases. Continued research on this front will be essential for improving how we treat these diseases. We are also exploring ways early detection or diagnosis can help prevent some of these diseases. Research has started to demonstrate the interconnectedness between various disease states. For example, repeated traumatic brain injuries (TBIs) and mild TBI (mTBI), also known as concussion, have been linked to development of chronic traumatic encephalopathy (CTE) later in life. While we are still in the exploratory phases of understanding how these diseases fully intertwine, diagnosing TBIs earlier and more objectively gives us a better chance of preventing CTE and other neurodegenerative disease. We’re particularly interested in exploring how the biomarkers we and others have found could be used to track patient treatment responses. The tool clinicians most commonly ask us for is a test or algorithm that can best identify treatment responders or nonresponders. For example, once patient treatment is initiated, can we track differences in RNA levels we’ve found and inform a clinician that a patient is indeed responding to a particular medicine or not. If not, the clinician will have the opportunity to alter their treatment plan to reduce the likelihood of an adverse event or relapse in the case of MS. Previous work has shown that lncRNAs (the type of RNA we’re measuring) exhibit a high level of cell-type specificity. Our theory is that lncRNAs will also exhibit a high level of disease specificity. In comparison to previous genes we’ve studied, including protein-coding genes (mRNAs), we’ve found that the differences seen in lncRNAs are greater. To analyze the data we generate, we use machine-learning techniques capable of creating models to distinguish multiple disease classes. When the differences are greater, the machine learning models are more easily defined, and the accuracy of these methods improves. Using our approach, the lncRNAs we have identified can be used to distinguish multiple inflammatory and noninflammatory diseases and identify those diseases early. These lncRNAs are also showing potential to track treatment responses in patient cohorts we follow over time. The machine learning models we use produce scores that indicate how alike or dislike a specific pattern resembles our disease of interest. Expression levels of lncRNAs change as a consequence of treatment. Scores are altered when patients respond (or do not respond) to treatment. Our group is excited about the potential for this technology to help clinicians at the point of care. As we think about the future and the therapeutics that will soon be available, our group has initiated studies to actively explore early markers of AD. In IQuity’s research lab, we have started exploring RNA markers that can distinguish this disease from other neurologic conditions. Therapies for people with AD will be most effective when prescribed early. Like others in this field, we believe that current diagnostic tools for AD are useful, but they could be enhanced to offer inexpensive, noninvasive options to detect AD before irreversible damage occurs. We believe that in regenerative medicine, we’ve reached an era where the interface between scientific facts and science fiction actually meet. The ability to clinically produce all cell types of the nervous system and transplant them in a region affected by certain disease is fascinating. Astrocyte dysfunction is implicated in multiple neurodegenerative diseases and disorders. At Kadimastem, we plan to explore the possibility that AstroRx could be beneficial in additional neurodegenerative indications, including AD, stroke, MS, TBI, spinal cord injury (SCI), and PD. Once we demonstrate the efficacy of the cells in treating additional neurodegenerative disease in animal models, the regulatory pathway to clinical trials approval will be shorter, as AstroRx’ safety was already demonstrated and the GMP manufacturing process of the cell is well established. In addition to human astrocytes, Kadimastem produces an enriched population of human oligodendrocytes that were mainly used for drug discovery but when transplanted may be of great benefit for demyelinating diseases including MS. In the emerging innovations in the field of 3D printing, we find great potential in our glial and neural cells to serve as “bio-ink” or “cell-ink” for generation of central nervous system (CNS) tissues. We may produce a spinal cord patch composed of a scaffold of human astrocytes, neurons, and oligodendrocytes with regenerative properties. This patch could be transplanted into the injured area in the spinal cord of patients with SCI to allow regeneration and reinnervation of neurons, serving as a tissue connector to bypass the damaged area. Another enthralling field is the use of exosomes, which are small extracellular, membrane-bound vesicles (50-150 nm in diameter) secreted by cells to selectively transfer biologically active compounds, as a mode of intercellular communication. We are planning to explore the beneficial effect of exosomes secreted by human astrocytes. These could be harvested in large quantities and formulated as off-the-shelf product. The small size of exosomes might allow noninvasive administration (eg, intranasal delivery) for direct transport of compounds into the cerebrospinal fluid (CSF) along the olfactory pathway. Having functional healthy cells that build up the brain and spinal cord stimulate the imagination, and offer plenty of new options and approaches to treat neurodegenerative diseases. If the PET scan is reliable and reproducible, it will allow us to peer inside the living human brain for the first time to assess the density of synaptic connections and possibly track changes over time. When combined with synaptic biomarkers in patient CSF, measured by Simoa technology (in collaboration with Quanterix), it could be a powerful tool to help us assess the impact of experimental therapies far more quickly than a traditional, years-long clinical trial. Our preclinical research approach at Rodin uses complementary tools to prioritize compounds based on assessment of synaptic gene expression, changes in synaptic structure, and functional impact in relevant animal models. Outside our labs, I’m interested in research into the role microglia may play in spurring inflammation and perhaps exacerbating neurodegeneration across several brain diseases. What Breakthroughs Seem Far-Out and How Can Those Come to Fruition? IQuity’s mission is to identify chronic diseases, including neurologic diseases, at early as possible so clinicians have the best chance to help patients live longer and higher-quality lives. It’s always been our position that early diagnosis and early treatment lead to the best long-term outcomes. This mantra is reinforced by many different patient- and provider-focused groups in the field of MS. Unlike many decades ago, we are now fortunate to have drugs that are highly effective, especially when they’re administered early. Not all drugs work for every patient, so the ability to link the right medication to the right patient and monitor an individual’s treatment response is critical. A number of tools exist that allow clinicians to begin to explore these trends, but there is still room for advancement. As we think about future opportunities to further refine the tools given to providers, an avenue of investigation we’re exploring is the ability to subtype various forms of a specific disease. In MS, a number of therapies are available to treat relapsing-remitting forms of the disease, and we are beginning to see a number of therapies emerge for the treatment of primary-progressive and secondary-progressive types of MS. An example of this is the approval of ocrelizumab, the first FDA-approved medication for use in primary-progressive MS. Not all MS medications can effectively treat each type of MS. Through our analytics, we are creating RNA-based data models that can be used to identify these unique types of MS so that clinicians can link a specific diagnosis to an approved treatment. The studies are in very early stages, but creating a diagnostic tool is something that may be very much within reach. Apart from test creation, we are fortunate to have access to a variety of data sources that inform our understanding of the doctor-patient interaction and how patients can utilize healthcare most effectively. Patient-derived information exists in forms ranging from limited biomarker (genomic) or biometric datasets to population-level information spanning claims data, EHR exports, and other public or private datasets. These datasets, when stitched together, create an opportunity for clinicians to understand the positive or negative drivers of patient outcomes. With recent advances in data science, we are beginning to see broader applications of predictive and prescriptive modeling. Using MS as an example, if we were to use these datasets to build models to inform the selection of one medication over another or anticipate a relapse, the act of creating these computer models will uncover patterns in the data that give us clues about critical drivers of treatment selection or relapse. A critical piece of successful data-science projects is the ability to identify the optimal parameters or data patterns that serve as inputs into computer models to build accurate reproducible predictions. Machine-learning methods are capable of identifying trends that aren’t always obvious to the human operator and are often identified by sampling thousands of individuals over expansive geographies. By layering multiple datasets, we can create tools to be used at the point-of-care to present a holistic view of the patient and provide insights that clinicians have never considered before. The use of these strategies presents us with the opportunity to dramatically change how patient care is delivered. I think our novel strategy to improve brain synaptic integrity through epigenetic modulation represents an innovative therapeutic approach. But we’re using known mechanisms, specifically targeted histone deacetylase (HDAC) inhibition, to get there. Several approved drugs use HDAC inhibition to treat cancer, but these have been too toxic for use in neurologic disorders. We’ve developed compounds that are far more selective in binding only to specific HDAC complexes and should prove to be far safer for long-term use in diseases like AD. Outside of neurology research, I’m very excited about the potential for gene therapies broadly and gene editing in particular. For diseases with clear genetic etiologies, these technologies could transform patient care. I feel lucky to be working in the biotech hub of greater Boston, where so many cutting-edge technologies are advancing potential new therapeutics. Tissue engineering refers to the practice of combining scaffolds, cells, and biologically active molecules into functional tissues. Kadimastem can serve as manufacturer of the “cell-ink” component. Though this field possess great potential, it still faces great challenges. The CNS is one of the most complex tissues in the human body, with different infrastructure for different parts of the brain and spinal cord. Engineering tissue that can recapitulate neuron connectivity and proper wiring with the appropriate structural support may be a daunting task, in contrast to tissues with a simpler structure (eg, engineered skin that has already being approved by the FDA). Nevertheless, we believe in the great potential of this field and hope to play a significant role in accelerating the development of first CNS tissue prototype. At Quanterix, we are on the cutting edge of the latest technological innovations and we take great pride in that. We also feel privileged to be able to use these innovations to change the current health care system. While it may seem far out now, I believe that in the next several years patients will be able to monitor their health in real-time with even greater precision. I envision a day when patients will be able to go to their primary care doctors and have their baseline biomarker levels taken through a simple blood test to identify changes that could indicate the onset of disease. Even further out, but still in the foreseeable future, we will eventually get to a place where people can get regular biomarker level updates delivered to their smartphones and smartwatches for even faster results. This will likely mean the annual physical will become an antiquated benchmark of health. In return, the doctor-patient relationship will become much more collaborative, precise, and meaningful. The first step to making this vision a reality is continued innovation and research. While the benefits of real-time biomarker readings are undeniable, many would agree it is more important to be accurate than to be fast. We’ve seen countless examples of companies who have rushed to make their technology consumer facing and have failed. That’s why we are focusing our efforts on growing our research bench to further prove the accuracy of our technology before its potential application at point-of-care. With over 200 peer-reviewed studies to date, we are well on our way to bringing this vision to fruition while ensuring everyone who stands to benefit from this great opportunity trusts in the process. How Will Your Work Today Change Patient Care Over the Next 20 Years? Patient care today is reactive. It is often only at symptom onset when we act to investigate the problem, only to discover underlying causes or preexisting conditions. This approach represents a lack of knowledge that has plagued our health care system for years. I believe the work we are doing has the power to change this and can transform our approach to patient care from reactive to proactive, giving doctors and patients greater access to the data necessary to understand their true health, in turn catching disease before it can progress. Moving the approach from diagnosis to prevention will require a fundamental shift in mindset from all stakeholders across the industry. It also hinges on our ability to advance biomarker testing. Fortunately, we’ve already seen evidence of these elements moving forward. A new research framework for AD issued by the NIH and Alzheimer’s Association, for example, recognizes the preclinical stage of AD and centers around a biomarker-based disease continuum. I am encouraged by developments like this, which signal that we have already begun to take steps to alter patient care. Our preclinical data suggest that our lead drug candidates can impact the molecular, structural, and functional deficits associated with neurodegeneration by amplifying the expression of synaptic genes that are critical to learning and memory. This results in durable improvements in spine morphology and synaptic density. We strongly believe that these compounds will demonstrate clinical benefit at multiple stages of disease and could work in synergy with existing treatments. We’re excited to take our lead compound and others in our pipeline into the clinic in the months and years to come. We are determined to deliver transformative therapies that will improve cognition and boost quality of life for patients with neurologic diseases. What is Your Thought Process for Identifying New Targets? We used our capabilities to produce human astrocytes, oligodendrocytes, and developed high-throughput human cell-based screening assays for the discovery of new active compounds. Use of these cell- based assays can allow us to discover lead compounds that can be further tested in relevant animal models. In terms of human astrocyte cell-based assays, we have the capabilities to find compounds that can affect the capacity of astrocytes to uptake excess glutamate, secrete numerous neurotrophic factors, and promote the survival of neurons and neurite outgrowth. Each of these functions has great therapeutic potential in many neurodegenerative diseases. Similar approaches were applied using our human oligodendrocyte cell-based screening assay. In these assays we already identified compounds that affect the capacity of oligodendrocyte precursor cells to proliferate, differentiate, and eventually myelinate neuronal axons. This system is useful in discovering lead compounds that can affect demyelinating diseases. As I alluded to before, neurology is perhaps one of the least advanced areas when it comes to therapeutic targets for treatment of these diseases. The process for identifying new therapeutic targets is complex and relies on a wide range of technologies, but where we can play the greatest role is in being able to easily measure the efficacy of drug treatments on those new targets through measurement of blood-based biomarkers, without requiring CSF or subjective measurements of symptoms. In addition, a large part of accelerating change involves greater funding for research in the form of government grants and private dollars. Pharmaceutical companies in particular have a unique opportunity to accelerate the research needed to identify new therapeutic targets. In order to get their buy-in however, we need to continue to focus on presenting evidence of biomarkers’ potential to advance drug development. The accessibility of human induced pluripotent stem cells (iPSCs) in research has dramatically increased the opportunity to identify and evaluate novel targets in cells from patients with a clinically diagnosed disease. I think human iPSCs will provide a range of very exciting new therapeutic targets in the near future. These in vitro discovery efforts are critical for understanding pathways and generating hypotheses, but equally important is the appreciation of the immense complexity of the neuronal network that makes up our brains. For any novel therapeutic target, we explore the science on multiple levels, starting with the molecular changes that underlie our hypothesis. Our investigation extends to any potential structural changes in specific brain regions and, importantly, to the functional level too, so we can understand if the network connectivity has been altered based on our target interaction. Due to the complexity of the brain, I think it is critical to link any molecular change to a measurable change in the neuronal network that can be used both in a preclinical and a clinical setting. What Else Would You Like to Share With Our Readers? It is frustrating to see multiple negative late-stage clinical trial outcomes in persons with AD, but this also underscores the importance of continuing to push forward new ideas refined by what we have learned from prior studies. As an industry, we’re determined to make a difference in the lives of patients and their families. I’m proud to be part of that movement and grateful for the support Rodin has received from patients, physicians, and advocates for those living with neurologic diseases. Today we have access to some of the most cutting-edge technologies this world has ever seen. Innovation is at an all-time high. Each day I am humbled by all of the advances being made, particularly in neurology. As technology moves forward we must work even harder to ensure our goals and aspirations to change medicine do not supersede what science proves we can do. Look no further than the revelations surrounding Theranos to see how believing so strongly in a mission without defendable evidence can open us all up to skepticism and distrust. We must ensure that as medical and scientific practitioners we set an example by ensuring every breakthrough or advancement is deeply rooted in science. Furthermore, I want each and every person to understand the critical role that they play in effecting industry change, especially across neurology—among the most widely examined and problematic therapeutic areas in medicine. To do this however, we must make a commitment to challenge the status quo. We must not get discouraged by failed trials, rather see these as opportunities to consider new approaches to antiquated problems. We must follow the research and go where the science leads. We must maintain an open mind and leverage new technology developments that can accelerate the research to end these terrible diseases. Above all, we need to be outspoken and transparent, while fostering collaboration that will catalyze a movement in our approach to neurological diseases and the greater healthcare system. At our core, IQuity is an analytics company that recognized the value of applying machine learning technology to facilitate our research and to investigate how we can anticipate and optimize the treatment path for patients living with chronic illnesses. When we first began, we found ourselves confronted by a data dilemma—our genomics research generated datasets comprised of hundreds of thousands, if not millions, of data points, and we needed the ability to comb through these large datasets efficiently. Since the use of machine learning was in its infancy, we had to construct many of the methods used to interrogate these datasets ourselves—we couldn’t just grab software off the shelf. We observed that by allowing the machine to pick out the patterns, we could discover trends in the data that we may not have ever seen simply looking at the datasets ourselves. Human beings have limitations. This early adoption of machine learning has informed everything we’ve produced thus far including our genomic blood tests and the broader analytics platform we recently released which is capable of looking at population-level data to create predictive and prescriptive algorithms to detect, monitor and treat chronic illnesses like MS.
What’s important for your readers to know? They should be aware that emerging innovations are soon coming online to assist with clinical decision-making. These innovations will include novel diagnostic/biomarker assays and more complex artificial intelligence solutions capable of assisting with clinical decision-making. It’s important to recognize the role of technology—it is not to replace clinicians or second-guess their clinical judgment and expertise; it is another tool that gives them information they do not currently have to help them provide the best care possible for their patients. The future of healthcare delivery is exciting and new frontiers are constantly being explored and applied to improve clinician effectiveness, patient outcomes, and lower costs to the healthcare system. Paraphrasing Sir Isaac Newton: if I have seen further it is by standing on the shoulders of giants. The 30th of August 2017 was a truly historic-giant day for science and innovation. In the US, the FDA issued approval of Kymriah, a genetically modified cell-therapy treatment. The FDA commissioner stated “We’re entering a new frontier in medical innovation with the ability to reprogram a patient’s own cells to attack a deadly cancer. New technologies such as gene and cell therapies hold out the potential to transform medicine.” We believe that the progress in the field of regenerative medicine will accelerate the approval of additional cell therapies, including Kadimastem’s therapy AstroRx for the treatment of persons with ALS and hopefully other neurodegenerative diseases. 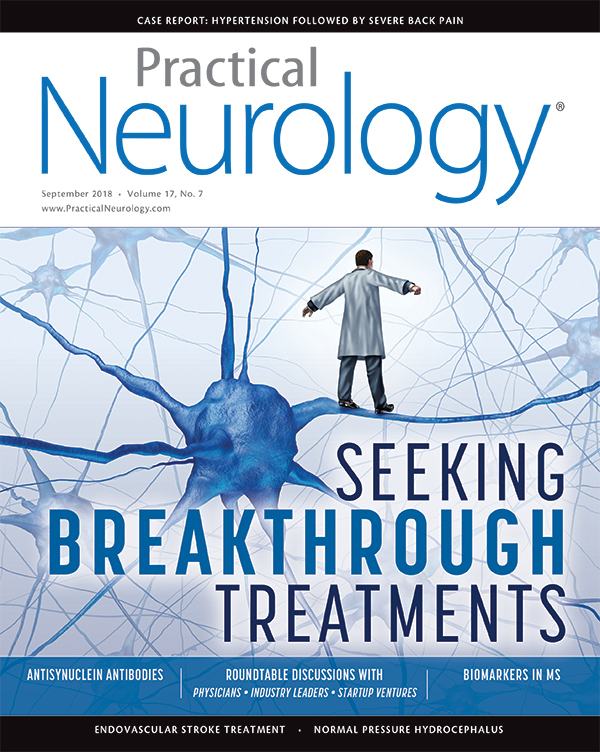 Practical Neurology would like to thank the companies and their leaders for participating in this roundtable. Once an uncommon controversial diagnosis, piriformis syndrome is now understood as a sciatic nerve entrapment neuropathy. A recently graduated resident and new professor recommends ways to attract medical students to the specialty of neurology. Carefully weigh the cost to patient in time, money, and possible pain against diagnostic benefits before referring for an EMG.